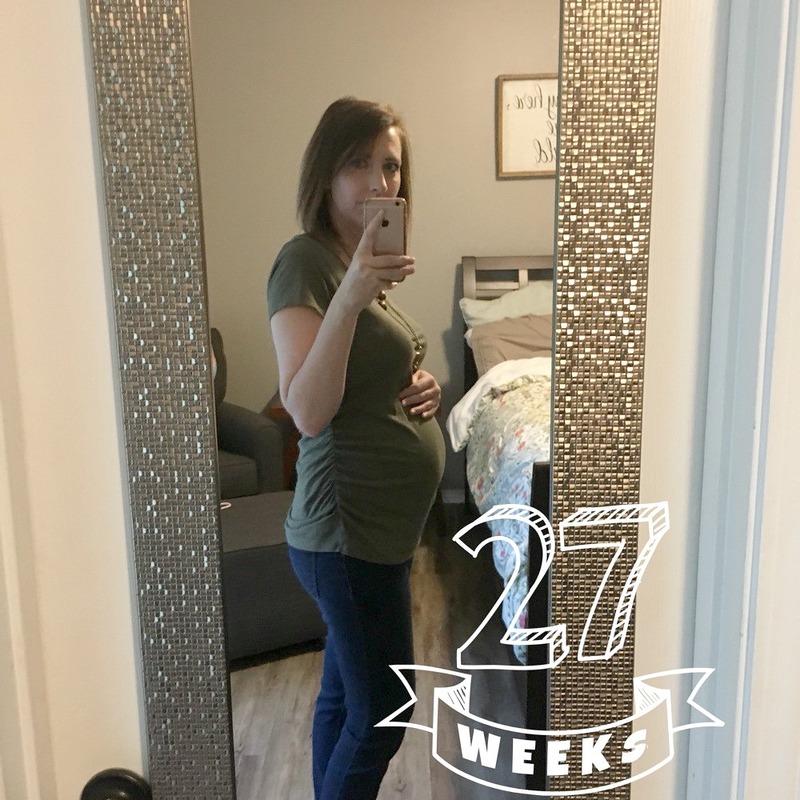 After last weeks catch up post, here is my first weekly update. 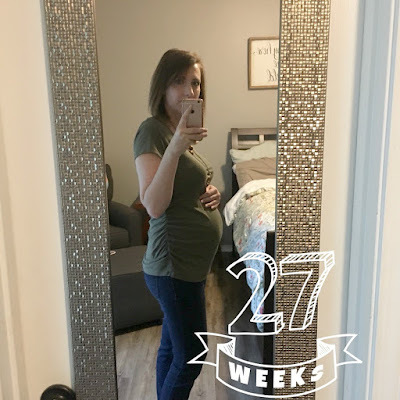 We made it to week 27, and while it’s considered the last week of the second trimester, I consider it the beginning of the third since yesterday was the 3 month mark til my due date. So as today, I’ve made it 2/3 of the way through. How has it gone by so fast!? Baby Size: Baby is 15 in and 2.2 lbs so roughly the size of a cucumber or a head of lettuce. Symptoms: Symptoms this week include nightly 4am leg cramps which bolt me out of bed faster than any pregnant woman should move. I’m also continuing the daily battle with heartburn, does this mean a hairy baby? On top of these lovely symptoms are what I tout as growing pains. Specifically in my rib cage area as my bump gets larger and larger. Currently Missing: I’m missing lunch meat this week. I’m really craving a sub sandwich. It’s been long recommended that pregnant women avoid lunch meat for fear of listeria. I’ll admit I’ve cheated a few times when there were no other options. But I haven’t really enjoyed it without worry. Sleep: The bump now needs full time pillow support as gravity has taken over and made side sleeping uncomfortable. Sleep has also been disturbed by those nightly leg cramps I mentioned in the symptoms. Cravings and favorite foods: TACOS! Could every day be taco Tuesday? Mood: Productive. Can productive be a mood? I guess the reality of the final stretch has hit and I’m bound and determined to get my house in order and my day job ready for my relief to take over. 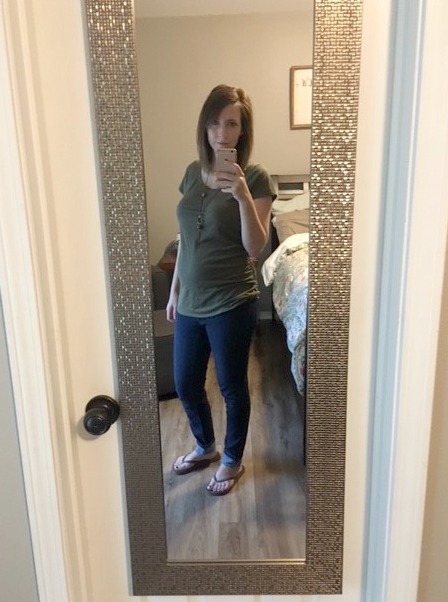 Maternity clothes: This week I am loving this olive green top from Target (similar to this one) and these maternity jeans that I found on Motherhood Maternity. Let me tell you about these jeans, they don’t have the normal panel that you find on maternity pants. Instead, they are more like regular jeans with a little stretchy paneling on the side/hip. These are my favorite for a girl who wears jeans practically every day. Buying: This week I purchased a few items for my sister’s baby shower that I’m helping to host next week. Once the shower is over, they will go perfect in the nursery. I can’t wait to reveal what I’m planning for the nursery, all in due time. 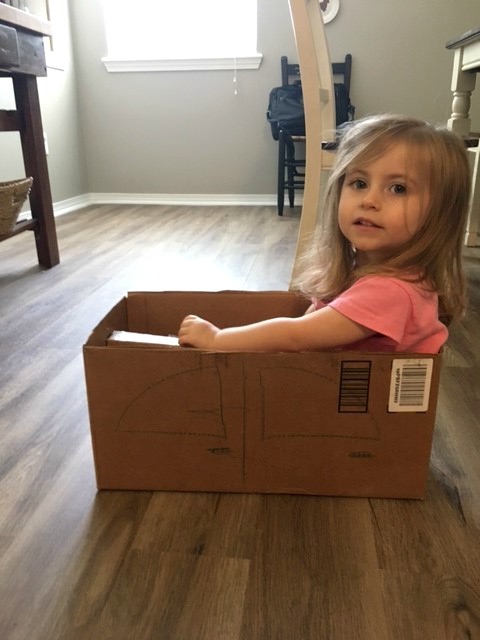 Aspens Reactions: This past weekend, we played pretend with a cardboard box. Aspen made it into a fun car to drive around with a steering wheel. Once she was done playing, she gathered up her supplies and asked to make something for Baby Brother. In an attempt to de-clutter, I talked her into drawing a picture for him. Nonetheless, I had major heart-eyes for her desire to create something just for her brother. « Gender Reveal – Guns or Glitter?